BARBARAELLEN KOCH FILE PHOTO | Baiting Hollow farmer Jeff Rottkamp turning over one of his fields earlier this year for the planting of early sweet corn. Growing sweet corn on the North Fork is an art form. It takes time, attention and plenty of fertilizer to ensure crops have enough nutrients to thrive. The results are delicious, but the process can cause unintended harm to the environment, namely pollution from nitrogen that seeps into ground and surface water and feeds damaging algal blooms. In an effort to achieve a successful harvest while protecting the environment, Suffolk County farmers are participating for the second year in a conservation project this summer to reduce their use of nitrogen fertilizers on sweet corn and potato crops. The technology, called controlled-release fertilizer, is designed to break down gradually according to the plant’s need for nutrients. The product would replace conventional fertilizers that can dissolve during heavy rains and enter local water systems. Cornell Cooperative Extension and American Farmland Trust are spearheading the water-quality improvement project. CCE is working directly with 35 farmers to calibrate equipment to apply fertilizers at the correct rate. To test the product’s efficiency, samples will be taken from corn and potato crops produced with traditional fertilizer and controlled-release nitrogen fertilizer to determine if both crops are receiving adequate nitrogen, according to AFT. Last year’s program had 10 participating farmers, who were able to cut their fertilizer use by an average of 20 percent while sustaining farm productivity, according to AFT. Marty Sidor, owner of North Fork Potato Chips in Cutchogue, said the product fits well in his planting and fertilizing plan. Fourth-generation farmer Phil Schmitt, owner of Schmitt Family Farm in Riverhead, is having similar success with the conservation methods. To regenerate the soils, Mr. Schmitt employs an integrated pest management approach to reduce his use of pesticides and spreads compost to reduce the need for synthetic fertilizers. As a part of this initiative, Mr. Schmitt is using controlled-release nitrogen fertilizer on all of his sweet corn. To encourage participation, the program provides risk protection for farmers interested in reducing dependence on traditional fertilizers, but concerned about possible yield losses. The farmland trust and AgFlex, a private company that manage the risks farmers face when adopting conservation practices, introduced the protection policy to 10 Suffolk sweet corn growers in 2012. It pays farmers cash if a new conservation practice, such as switching to a controlled-release nitrogen fertilizer, reduces yields — and therefore income. Becky Wiseman, CCE’s agricultural environmental stewardship coordinator who works with farmers on the program, said it addresses water contamination, one of the toughest issues local farmers have ever faced. The region’s aquifers, the sole source of drinking water, as well as Long Island Sound and the Peconic estuary, suffer from heightened levels of nitrogen, according to the farm trust. Suffolk County long ago recognized that safeguarding agriculture involves safeguarding agricultural lands. Suffolk launched the country’s first farmland preservation program in the 1970s. Before that, aggressive real estate development reduced land in active farming from 100,000 acres during the mid-1900s to the current 34,000 acres. Without the action, Long Island would have lost nearly all of its farms, Mr. Haight said. Today, agriculture is the backbone of the region’s economy. Suffolk County ranks first in New York in annual farm sales, with more than $300 million in farm products sold in 2010, according to the trust. “We hope Suffolk County will once again be a national leader by demonstrating that it’s possible to work with farmers to protect water quality while keeping farms economically viable,” Mr. Haight said. BARBARAELLEN KOCH FILE PHOTO | Some of the North Fork’s corn crops are known to be grown from genetically modified seeds. New York could become the first state in the nation to require that genetically modified foods be labeled as such, a move farmers say could put locally grown produce at a disadvantage. State Senator Kenneth LaValle (R-Port Jefferson) and Assemblywoman Linda Rosenthal (D-Manhattan) have sponsored legislation to require mandatory labeling of genetically modified food. The bills follow years of debate over the safety of genetically modified foods, which were introduced in the early l990s. Legislation has been proposed in several states, including California, where it was put before voters in 2012 as Proposition 37 and failed by a slim margin. Bills have been introduced more recently in Connecticut and Maine. A genetically modified organism (GMO) is produced when genes from one species are extracted and artificially introduced into the genes of another, according to the American Heritage Medical Dictionary. The practical applications of this process include giving a plant the ability to produce its own pesticide to deter insects, thereby saving farmers having to apply costly and potentially dangerous pesticides, according to the Institute for Responsible Technology, which investigates the risks and impacts of GMO foods. Major GMO food crops include soy, cotton and corn, said Dale Moyer, associate executive director of agriculture for Cornell Cooperative Extension of Suffolk. It’s not employed on fresh fruits and vegetables such as oranges or peppers. Varieties of sweet corn are the only GMO crops grown on the North Fork intended for human consumption, but they’re very limited, Mr. Moyer said. Some area farmers also grow field corn, used primarily as animal feed, he added. Under the pending legislation sweet corn varieties grown from genetically modified seeds would fall under the mandatory labeling requirement. But Steve Ammerman, spokesperson for the NYS Farm Bureau, said mandatory labeling is unnecessary. He argues that labeling will put GMO-grown products at a disadvantage when placed next to other produce. “If a consumer walked up and saw a label that said ‘Contains GMO,’ it misleads the consumer,” he said. Kathleen Furey, director of GMO Free New York, said genetically modified foods have not been proven safe. There have not been any long-term, independent, peer-reviewed human consumption studies to support that claim, she said. The longest study to date on GMO foods ran about two years and involved rats, not humans, she said. The study, led by French scientist Gilles-Eric Séralini, found that mice fed a diet of genetically modified corn experienced increased mortality, tumors and organ damage compared to a control group that was fed non-modified corn, said Ms. Furey. “We deserve the right to know what were eating,” she said. About 80 percent of what shoppers see on supermarket shelves contain GMOs, said Ms. Furey. Many of the products are processed foods, including infant formulas. Consumers do have one way of spotting GMO-free foods. Certified organic foods do not contain genetically modified products, Mr. Ammerman said. If labeling is mandated, farmers would rather see labeling say something like “GMO free” as compared to “contains GMO,” said Joe Gergela, director of the Long Island Farm Bureau. The legislation is expected to come up for a vote before the current legislative session ends June 20. 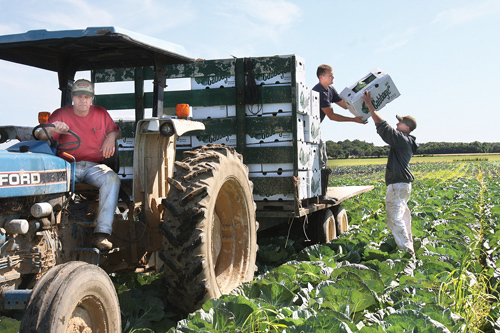 BARBARAELLEN KOCH FILE PHOTO | Farmer Phil Schmitt (left) and his sons Matt (center) and Phil Jr. loading boxes of cabbage onto a flatbed at the family’s Riverhead farm in 2011. Phil Schmitt says most food safety issues have come out of West Coast and large farm operations. North Fork farmers are facing new government regulations they say will lead to too much paperwork — only to fix a problem that exists elsewhere in the U.S. The new regulations, part of the federal government’s Food Safety and Modernization Act of 2011, aim to protect U.S. consumers from contaminated food products by improving produce production and packaging safety. The regulations pertain mostly to water quality monitoring, worker training and cleanliness. They also require documentation that farmers are meeting these standards, as well as daily record-keeping of activities on the farm. The idea, according to the FDA, is that during an outbreak of food-borne illness, the records could help determine the source of the food involved. But local farmers say all the large outbreaks of food-borne illness from U.S. produce is related to food grown elsewhere in the country. Before the new regulations were drafted, 14 FDA officials toured three North Fork farms in August 2011 to see how local farms were run. Of all the regulations, the documentation process will likely have the biggest effect on local farmers. “All the growers are practicing so many aspects of food safety, they are just not documenting them to the extent that this new rule is going to make them,” said Sandra Menasha, a Cornell Cooperative Extension educator who trains local farmers to meet the new regulations. Growers are going to need to be able to trace back every product that leaves their farm to the field where it was harvested, down to the hand that picked it, Ms. Menasha said. She has a 70-page document listing the different types of records growers will need to keep, which include daily temperate readings of refrigeration units, dates and times equipment is cleaned and sanitized and lists of visitors to the farm. One upside to the new law is that some small farms will be exempt from the regulations. Farms with an average annual income of less than $500,000 for the past three years, which sell more of their products direct to consumers than to other distributors, would be considered exempt, according to the act. Many area farms, however, do not qualify for the exemptions. Ms. Menasha estimates that about half of the North Fork’s farmers will still have to deal with the new regulations. Depending on the size of the farm, the FDA estimates it will cost farm owners between $5,000 and $30,000 annually to comply with the new regulations. Lyle Wells, whose family has been farming in Riverhead for centuries, said it would probably cost him $30,000 to hire someone full-time to handle the documentation alone, aside from all the other requirements he will have to meet. These new food safety regulations are still up for debate, as the FDA will be accepting comments on them through Sept. 16, a 120-day extension from its original deadline of May 16. Comments can be submitted electronically at www.regulations.gov or mailed to Division of Dockets Management (HFA-305), Food and Drug Administration, 5630 Fishers Lane, Room 1061, Rockville, MD 20852. GIANNA VOLPE PHOTO | Peter Sepenoski, right, of Sep’s Farm in East Marion with Senator Ken LaValle Monday. East End farmers gathered in East Marion Monday with Senator Ken LaValle to celebrate $1 million that was earmarked to allow 69 Suffolk County farmers to install about 180,000 feet of deer fencing on their properties. The press event took place at Sep’s Farm, where farmer Peter Sepenoski and family thanked Senator LaValle for helping them install the fencing to protect their crops. Representatives from the Suffolk County Soil and Water Conservation District joined the Sepenoski family Monday morning to thank the senator, who addressed those gathered on the importance of local agriculture.